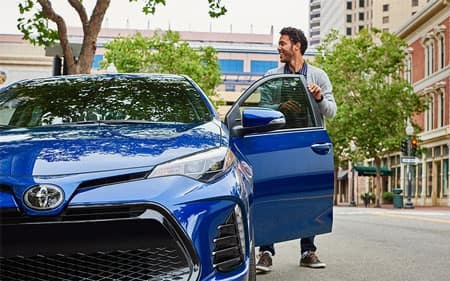 The perfect match for those who can’t stand blending in with the crowd, the 2019 Toyota Corolla captures the attention of bystanders thanks to an eye-catching profile, distinctive LED Daytime Running Lights, and an available rear spoiler. It standard 1.8-Liter 4-Cylinder engine provides 132 horsepower for an ideal blend of responsive power and fuel economy. An optional Sport Gauge Cluster, dedicated Sport mode button, and steering-wheel mounted paddle shifters add an additional dose of adrenaline on your commute. Advanced connectivity features allow you to bring the latest technology along with you on every journey. You’ll stay protected from the unexpected behind the wheel thanks to standard Toyota Safety Sense™ P (TSS-P) — a comprehensive collection of advanced driver-assistive safety technologies found on every Toyota Corolla. Offering the boldest look of the Corolla, both SE and XSE trim levels feature an aggressive front fascia with striking piano black accents. It’s also designed with functional aerodynamics to help the Corolla slice through the air and deliver maximized fuel economy. Optimized for both performance and style, standard Bi-LED headlights provide crisp illumination of the road surface all while using less energy than conventional bulbs. Available 17-inch alloy wheels provide a sleek complement to the striking profile of the Corolla. Offered in a full range of expressive exterior colors, there’s sure to be a Toyota Corolla which mirrors a personality as unique as your own. 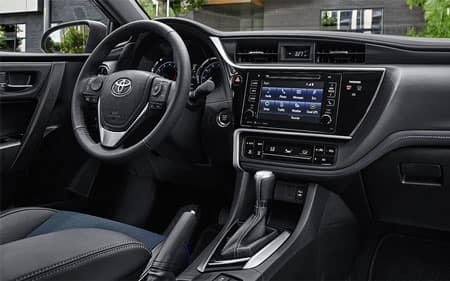 The interior of the Toyota Corolla offers a welcoming environment that’s spacious enough to fit your friends, your gear, and your next big ideal. In an effort to increase the upscale feel of the cabin, the dashboard layout features flowing lines, premium materials, and optional contrast stitching. Perfect for packing gear for your next weekend adventure, standard 60/40 rear seats provide endless possibilities. Optional SofTex®-trimmed front sport seats not only provide comfort and support on extended trips — they’re also durable thanks to water and stain-resistant protection. Fine-tune your temperature preferences with the available automatic climate control system found inside the Corolla. You’ll never miss a beat with the optional Entune™ Audio Plus system, featuring a 7-inch high-resolution touch screen, MP3/WMA playback capability, auxiliary audio jack, and Siri® Eyes Free. Voice recognition and steering wheel mounted controls help keep you attention focused safely on the road instead of fumbling with hard-to-reach buttons or knobs. A Smart Key System with Push Button Starts eliminates the need to fumble around in your pocket or purse trying to locate a traditional key. At the touch of a button, an optional power tilt/slide moonroof with sliding sunshade opens to fill the cabin with natural lighting and fresh air. 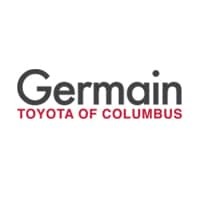 Included as standard on every 2019 Toyota Corolla is Toyota Safety Sense™ P (TSS-P). 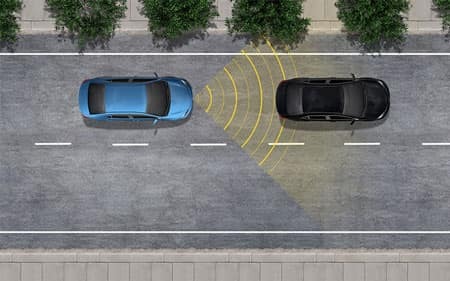 Its Pre-Collision System with Pedestrian Detection can mitigate or potentially avoid a collision by using an in-vehicle camera in radar to detect pedestrians or vehicles in front of you. You’ll always have the right amount of headlight power thanks to Automatic High Beams that can automatically toggle between high and low beams. Dynamic Radar Cruise Control continuously monitors vehicle-to-vehicle distance as you drive while automatically adjusting your speed. Lane Departure with Steering Assist is able to detect lane departure or shifts on roads with clear markings. In the event you stray outside of the lines, this feature can provide subtle steering corrections in order to guide you safely back into your lane. These are just a handful of the advanced safety technologies found on the Toyota Corolla. *MSRP includes the Delivery, Processing, and Handling Fee of $920 for Cars (Yaris, Yaris iA, 86, Corolla, Corolla HB, Camry, Camry HV, Prius LB, Prius c, Prius Prime, Mirai, Avalon, Avalon HV), $1,045 for Small/Medium Trucks, SUVs and Van (C-HR, RAV4, RAV4 HV, Highlander, Highlander HV, 4Runner, Sienna, Tacoma), $1,295 for Large SUVs (Sequoia, Land Cruiser), and $1,395 for Large Truck (Tundra). (Historically, vehicle manufacturers and distributors have charged a separate fee for processing, handling and delivering vehicles to dealerships. Toyota’s charge for these services is called the “Delivery, Processing and Handling Fee” and is based on the value of the processing, handling and delivery services Toyota provides as well as Toyota’s overall pricing structure. Toyota may make a profit on the Delivery, Processing and Handling Fee.) Excludes taxes, license, title and available or regionally related equipment. The Delivery, Processing and Handling Fee in AL, AR, FL, GA, LA, MS, NC, OK, SC, and TX will be higher. The published prices do not apply to Puerto Rico and the U.S. Virgin Islands. Actual dealer price will vary. **2019 EPA-estimated mileage. Actual mileage will vary.